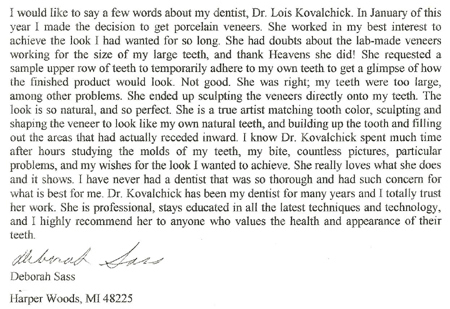 I have been a patient of Dr. Kovalchick's since 1987. 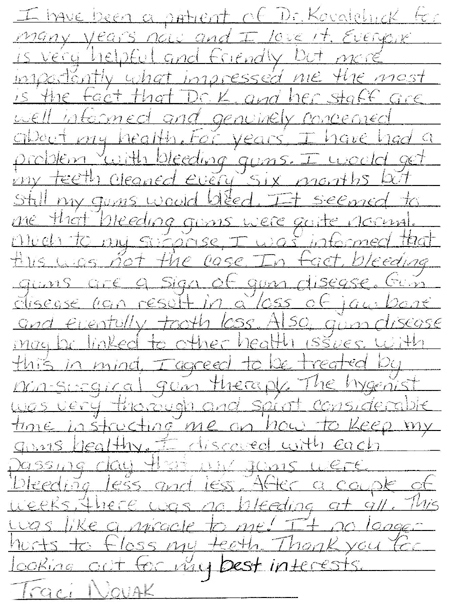 I admitted at the time that I did not like dentists because of bad experiences as a child. Dr. Kovalchick has changed all that!!!! She has been practicing painless dentistry since way-y-y-y-y before it became an advertising catch phrase. 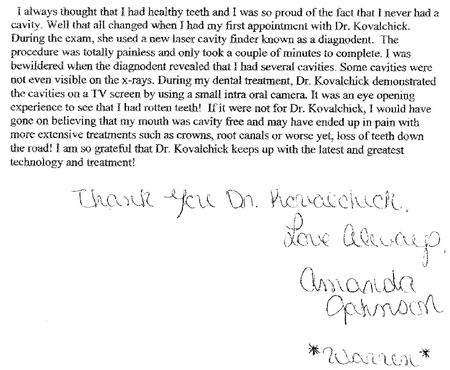 Dr. Kovalchick's techniques are fast, efficient, and painless. 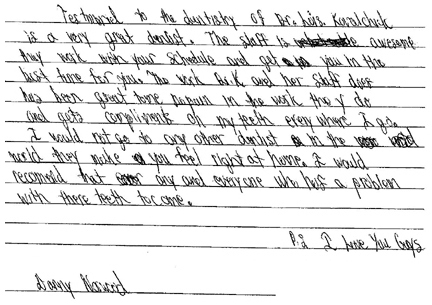 The staff is equally as wonderful as Dr. KovaIchick. 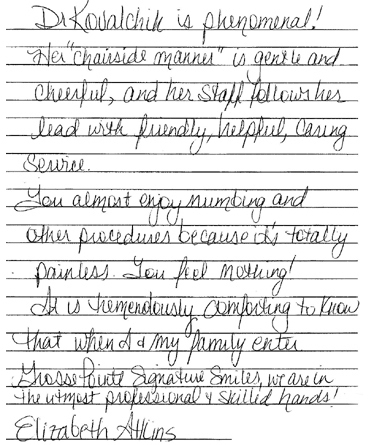 Everyone is friendly, knows their jobs inside and out and are always willing to help you in any way they can. The things I have learned from them will stay with me forever (and thanks to them so will my teeth). doesn�t have to be painful. He has learned a lot of preventive medicine techniques also. 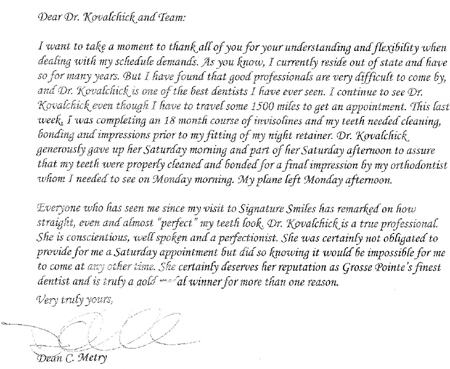 Dr. Kovalchick and her staff are the best! May I take this opportunity to say how pleased I am with my new smile. The time and expense spent on them has proved to be a sound investment. For many years now, I have never smiled widely at family photographs. Senior citizens like myself can do little about wrinkles, failing eyesight, etc, but a really nice smile is an option available to us that certainly pays off. It increases self-confidence and general well-being because you can present a healthy, happy face to the outside world. Many thanks for taking care of me. I'm looking forward to smiling at the Easter family photo shoot!" All of my life I have hated the thought of going to the dentist. This mindset lasted well into my adult life until a friend referred me to Dr. Lois Kovalchick's practice approximately ten years ago. Lisa's knowledge of her profession and her technical abilities will speak volumes once you experience what are probably the most complete preventative treatment and cleaning procedures available in dentistry. You too will feel comfortably assured that you are much, much more than just another mouth. 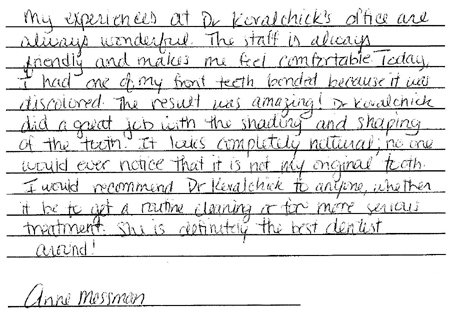 It is obvious that Dr. Kovalchick and her staff are constantly updating their knowledge of the latest techniques and incorporating them into the treatment of patients who will always enjoy the finest solutions available. I look forward to the day when I can open the dictionary to 'dentist' and find a picture of this office. Zoom has been such a uplifting experience. This summer I will stand up in two weddings and will feel so confident smiling and having all eyes on me and my smile! Thanks for making my smile so beautiful and helping me feel confident. Now I feel it's my duty as a bridesmaid to send the whole bridal party for a Zoom session. 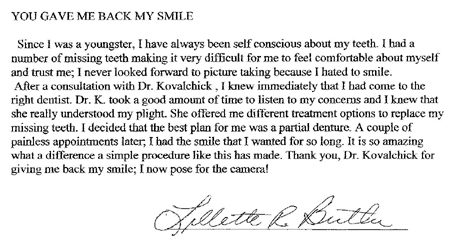 There is nothing better than a confident, happy and healthy white smile! My name is Myra, and I am one of lucky ones who was fortunate enough to meet and be treated by Dr. Petrillo and his wonderful staff. We came here because we are going to be on the Dr. Phil show and we were told to fix our smiles courtesy of the show. We looked for many dentists in the area and Dr. Petrillo’s office was the only one that didn’t turn us down. 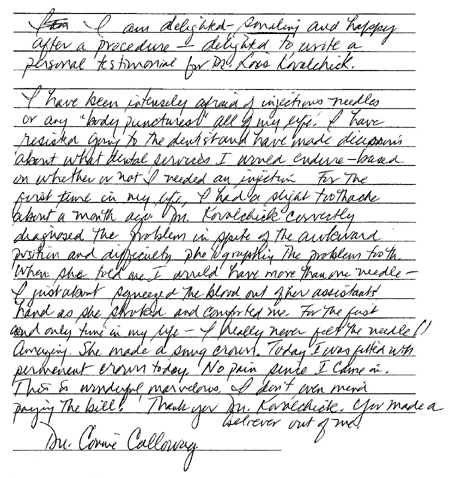 We were seen and evaluated by Dr. Petrillo. We were in awe of his generous hospitality and his huge and kind heart. 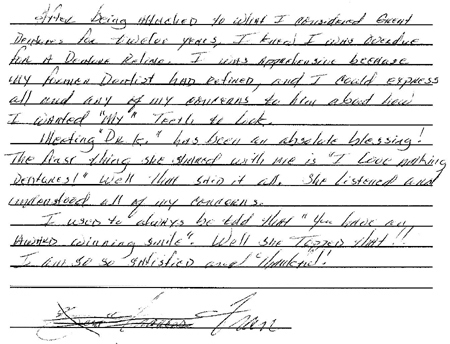 He not only took care of us and our dental needs, but he treated my husband and I with respect and kindness. Anyone that comes into his office will feel his work in their smile and confidence in their heart. God Bless you Dr. Petrillo and your staff. You are an inspiration to those you touch.